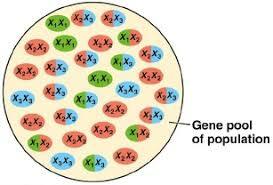 the sum total of alleles present in a sexually reproducing population. ​Evolution is the cumulative change in allele frequency or heritable characteristics in a population over time. The cumulative change can occur as a result of genetic mutations and selective pressures which favour certain heritable characteristics over other less favourable characteristics. Temporal isolation - occurs when two species mate or flower at different times of the year. Behavioural isolation - occurs when two species respond to different specific courtship patterns. Geographic isolation - occurs when two populations of the same species or breeding group are separated by a physical barrier, such as a mountain or body of water. Ecological isolation - occurs when two species inhabit similar regions, but occupy different habitats. Mechanical isolation - occurs when genital differences prevent copulation (animals) or when flowers are pollinated by different animals (plants). Hybrid inviability - hybrids are produced but fail to develop to reproductive maturity. Hybrid infertility - hybrids fail to produce functional gametes. Hybrid breakdown - the F1 (first generation) hybrids are fertile but the F2 fail to develop or are infertile. Speciation can occur gradually over long periods of time, with several intermediate forms in between species leading to today’s current species. This can be seen by some of the more complete fossil records, like the whale. However, in some species, large gaps were evident for certain species in the fossil record. This could be explained by possible imperfections in the fossil record, or perhaps, these species have not been discovered yet. ​Species descended from a common ancestor gradually diverge more and more in morphology i.e. become phenotypically different - adaptive radiation, through the slow but relentless effects of natural selection. Selection that removes individuals from one end of a phenotypic distribution and thus causes a shift in the distribution towards the other end. This occurs when natural selection favours one extreme end of the continuous variation of phenotypes. Over time, the favoured extreme will become more common and the other extreme will be less common or lost. For example, dark mice are favoured because they live in an area that favours that phenotype. A type of selection that removes individuals from both ends of a phenotypic distribution, thus maintaining the same distribution mean. This occurs when natural selection favours the intermediate phenotypes. Over time, the intermediate states become more common and each extreme variation will become less common or lost. Same mouse example where medium coloured fur is favoured over dark or light fur colour. A type of selection that removes individuals from the center of a phenotypic distribution and thus causes the distribution to become bimodal. This occurs when natural selection favours both ends of the phenotypic variation. Over time, the two extreme variations will become more common and the intermediate states will be less common or lost. Disruptive selection can lead to two new species. Light coloured and dark coloured mice might live in an environment with patches of light and dark vegetation making it hard for predators to spot those colours, while the middle coloured mouse doesn’t blend into either background. List example species in the genus Allium (by common name). The genus Allium comprises monocot flowering plants and includes the onion, garlic, chives, scallion, shallot, and the leek. In many of these species of plants, chromosome doubling has occurred naturally and through hybridization or selective breeding to create a large number of different phenotypes. This results in a number of reproductively isolated but similar populations. Polyploidy is a condition in which an organism has more than two complete sets of chromosomes in all somatic cells i.e. > diploid. It is far more common in plant species as they lack separate sexes and are capable of asexual reproduction (self-pollination). It may occur as a result of the failure of a meiotic cell to undergo cytokinesis (so chromosome replication occurs minus cell division). Consequently, gametes are diploid (2n) and resulting offspring are tetraploid (4n). Because tetraploid offspring can no longer mate with diploid organisms (triploid offspring tend to be infertile), speciation has occurred. Punctuated equilibrium was long considered an alternative theory of evolution and a challenge to the long established paradigm of Darwinian gradualism. How do paradigm shifts proceed in science and what factors are involved in their success? Anole lizards of the Caribbean islands are members of about 150 closely related species, most of which evolved within the past 50 million years from a single colonizing species. See the evolutionary process firsthand with this compelling case study in evolution. There is a dizzying diversity of species on our planet. From genetic evidence we know that all of those species evolved from a single ancient ancestor. But how does one species split in to many? Through the evolutionary process of speciation — which begins when populations become isolated by changes in geography or by shifts in behavior so that they no longer interbreed. This video illustrates the speciation process in birds to help you understand the basis of earth's biodiversity. Explore Research at the University of Florida: Pam and Doug Soltis, distinguished professors with the Florida Museum of Natural History, discuss the importance of Tragopogon, a flowering plant in the sunflower family, and its role in helping understand more about the polyploids. Polyploids are organisms with more than two sets of chromosomes and represent a large number of agricultural crops. The Soltises are analyzing Tragopogon to gain a better understanding of the process of genome change and evolution in polyploidy organisms.